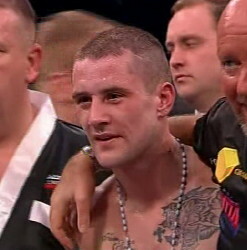 By Scott Gilfoid: WBO lightweight champion Ricky Burns (35-2, 10 KO’s) has made a believer out of Kevin Mitchell (33-2, 24 KO’s), who Burns stopped in the 4th round last Saturday night in Scotland. Mitchell believes that Burns has the talent to unify all the titles at lightweight, including the strap that’s held by WBC champ Antonio DeMarco. I think Mitchell is going a little overboard here. He needs to step back, drink a big cup of coffee and get some perspective on the fight. True, he whipped by Burns and knocked down twice in losing the fight by a 4th round knockout, but look at how much bigger Burns was than him. That was the story of the fight. When you face a guy that has rehydrated up well beyond your own weight then you’re probably going to have problems. The size is the only thing I see that Burns has going for him. He’s huge for a lightweight and he’s got a heck of an advantage when he fights lighter fighters. I’m afraid that Burns would be barking up the wrong tree if he fought Adrien Broner or Antonio DeMarco. First off, Burns wouldn’t have any weight advantage at all against Broner, so he wouldn’t have that advantage to rely on. Secondly, Burns doesn’t have Broner’s hand speed or power. Let’s face it, Burns is just a big fighter for the division but he’s not a big puncher and definitely not fast. Broner is stronger, faster and a lot better technically. I think it would be a slaughter if he faced the Scot. DeMarco is simply is a much offensively gifted fighter than Burns. He wouldn’t be heavier than him, but he’d be a lot more dangerous due to his power. I think DeMarco would destroy Burns no problem. The thing is, Burns probably won’t ever fight Broner or DeMarco. We’re already hearing talking of Burns possibly fighting Scott Harrison. You can bet that after that, Burns will be facing one of the contenders the WBO has ranked but definitely not Broner or DeMarco. Burns already had the chance to fight Broner last year when Burns held the WBO super featherweight title, but he vacated the strap rather than fight Broner when the fight was being talked about. Broner is doing Burns a big favor by going after the WBC title instead of looking to become his mandatory, because if Broner picks up the WBC strap, Burns won’t ever have to fight him if he doesn’t want to. I don’t think Burns ever will take the fight.